Phoenix has had a little over 300 days to relax since Super Bowl XLIX packed up and left town in early February. But in January, a similar pigskin spectacle will return to Phoenix when the College Football Playoff National Championship Game turns downtown into a college football wonderland. The Championship Campus expands the footprint of the game well beyond Glendale’s University of Phoenix Stadium on Jan. 11. 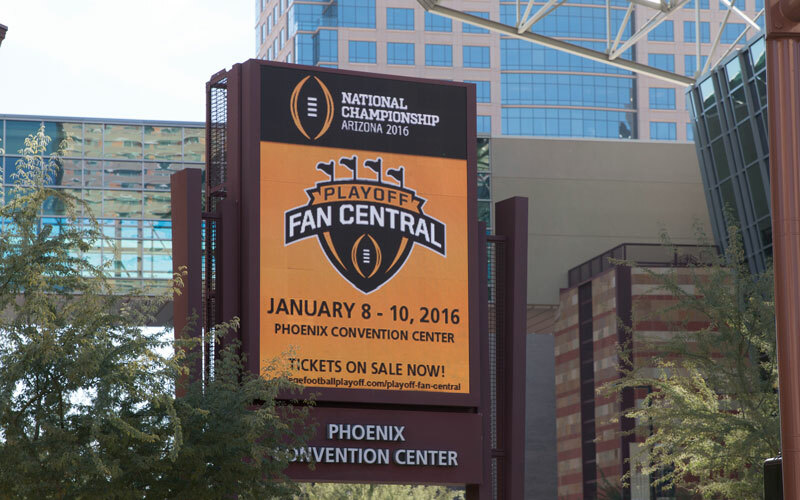 The eight-block area of downtown Phoenix will be transformed into a unique college football experience from Jan. 8 through 10. It is a page out of the Super Bowl XLIX events playbook. “What is really exciting is that we are going to have many of the same elements of the Super Bowl that really engage our local community,” said Debbie Johnson, director of the Arizona Office of Tourism. Super Bowl XLIX organizers closed off 12 blocks downtown from Jan. 28 to Feb. 1 for Verizon Super Bowl Central. The area included a rock-climbing wall and multiple concert stages. The Arizona Super Bowl Host Committee claimed that the five-day event attracted more than 1 million fans downtown. 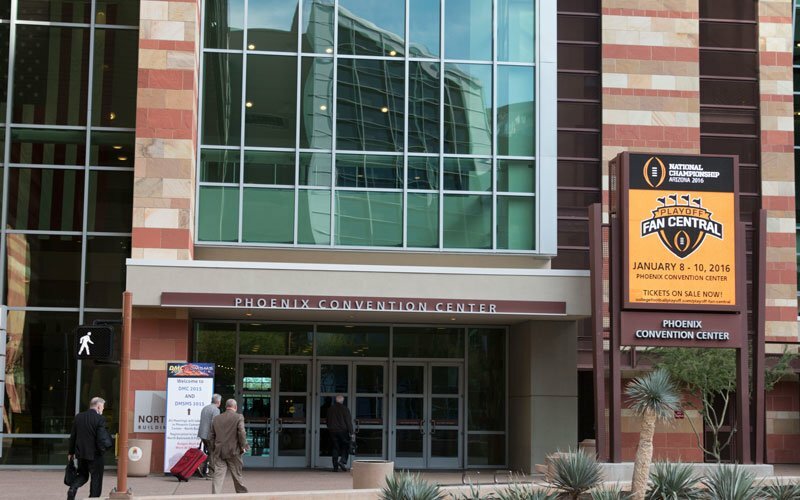 Many of the major events within the Championship Campus will take place inside the Phoenix Convention Center as part of Playoff Fan Central. Fans will be able to find interactive games, activities from playoff sponsors and exhibits, and personal appearances that “celebrate college football,” according to Wright. “Catch a pass, throw a football, get your picture with the trophy,” are just a few things Wright said fans will be able to do inside the convention center. In addition to those activities, fans will be able to watch the game’s media day on Jan. 9 on a 50-yard football field set up inside the convention center, featuring players and coaches from both teams. While entrance to the Championship Campus is free, admission prices for Playoff Fan Central are $12 for adults and $7 for children, students, seniors and military personnel. “This is going to be a four-day celebration of college football with something for everybody, for the college football fan and the not-football-fan alike,” Wright said. Playoff representatives also said they want the events to be family friendly. “You don’t need to have a game ticket to create a lasting memory from this event,” said Bill Hancock, executive director of the College Football Playoff. Just outside the convention center will be a free concert series, AT&T Playoff Playlist Live. It will feature acts Friday through Sunday in the same spot where the Pepsi Hyped for Halftime Concert series was last year, on Washington Street between First. and Third streets. The Band Perry, Ciara, Walk the Moon, Andy Grammer and John Mellencamp are all scheduled to make appearances. Game organizers will also conduct events to support schools, including the free Extra Yard for Teachers Summit. The half-day event on the Saturday before the game will feature different speakers, activities and motivational opportunities for teachers. “The teacher’s summit will bring some outstanding people to be able to interact with teachers of the Valley,” Hancock said. Speakers scheduled to be at the summit include Ruthanne Buck, a senior adviser to U.S. Education Secretary Arne Duncan, and Teach for America CEO Elisa Villanueva Beard. This will be the second year for the summit, which was first held in Dallas as part of the inaugural College Football Playoff Championship National Championship Game in January. This is the second season of the College Football Playoff, a four-team tournament that replaced the Bowl Championship Series. Events for this year’s game will take place across greater Phoenix, including a game day tailgate in Glendale and a media party in Scottsdale, but the main activities besides the game will be downtown, according to Wright. “There will still be events in other parts of the Valley, but the main happening up until the game will be in downtown Phoenix,” he said. The College Football Playoff National Championship is another page in the Valley’s long history of hosting major college football postseason events. The Fiesta Bowl has been played annually since 1971 in the area, which also hosted the BCS National Championship Game four times, most recently in 2011. “We have seen a lot of great college football events here but we have seen nothing like what is coming here (in January),” Hancock said.